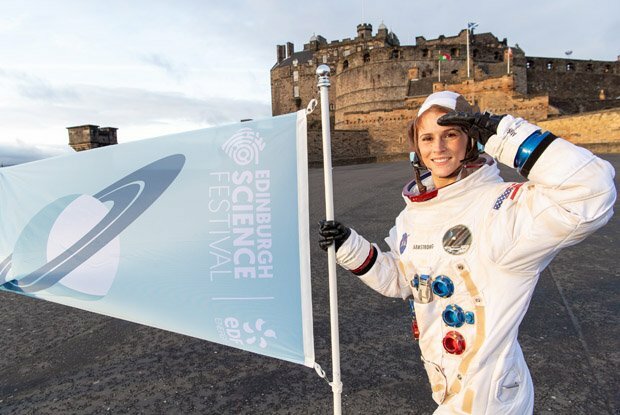 The Edinburgh International Science Festival is back for its 31st edition, with this year's packed programme celebrating the 50th anniversary of the Moon landing through the theme of 'Frontiers'. The 2019 festival will set out to explore this theme through a programme that delves deep into the latest in scientific research as well as uncharted territories, presenting 270 family and adult events at 31 venues between Sat 6 and Sun 21 April. The wide-ranging programme features events full of hands-on and interactive science activities, as well as talks, workshops and exhibitions at locations across the city. The theme of 'Frontiers' will be explored in various fields and capacities, including Planetary, Digital, Healthcare, Engineering, Environmental, Social and Food, with world-class scientists, academics and authors taking part. Highlights from the programme include A Human Touch, a major free open-air exhibition of images looking at human influence on Earth, which opens on Wed 20 Mar in front of the Scottish Parliament; and Build and Break which invites young visitors to the National Museum of Scotland's Grand Gallery to build magical structures with super-sized construction blocks and then head over to be set loose on a huge pile of discarded electronics with a screwdriver and a pair of pliers (under adult supervision of course!). The Edinburgh Medal, previously won by the likes of Prof Jane Goodall, Prof Peter Higgs and Sir David Attenborough, will this year be awarded to Christiana Figueres, executive secretary of the UN framework convention on climate change (UNFCCC), who was instrumental in the successful conclusion of the Paris talks. Audiences will have the chance to hear from Figueres as she gives her Medal Address during the festival. Elsewhere on the programme, the current and former Royal Society of Edinburgh (RSE) Presidents Prof Dame Anne Glover and Prof Dame Jocelyn Bell Burnell and RSE Young Academy of Scotland member Dr Silvia Paracchini will examine the profile of female scientists and share their personal experiences in Being Women in Science: Changed Times?. Radio 4's Helen Keen and space medicine expert Dr Christina Mackaill look at what happens when The International Space Station (ISS) springs a leak in Emergency on the ISS, and psychologist and author Prof Richard Wiseman will also be in conversation with Keen for Shoot For the Moon, which investigates the powerful life lessons behind humanity's greatest achievement, in a celebration of the 50th anniversary of the Apollo 11 Moon landing. Also, astronomer Royal Lord Martin Rees explores the themes of his recent book, On the Future: Prospects for Humanity, in a special event and Prof Jim Al-Khalili shares an insight into his first foray into fiction with his recent book, Sunfall. The hugely popular GastroFest will be making its return to provide an interesting peek behind the science of food, with events ranging from Cheeseology to The Science of Gin and Tonic. In the children's programme, you'll find five floors of hands-on science at City Art Centre, with favourites such as Blood Bar and ER Surgery coming back alongside five new workshops and interactive activities. And at the Pleasance, Experimentarium is back with with some weird, wonderful and cutting-edge science for children. Also at the Pleasance, Science in the Spotlight returns with another programme of special theatre-meets-science productions, including the world premiere of Melody and Sam: Record Breakers, which is aimed at children aged 5–8, A Multi-sensory Polar Adventure and Dr Megaphone Goes Zap!. Edinburgh International Science Festival, Sat 6–Sun 21 April, sciencefestival.co.uk. She has not held that position since July 2016.